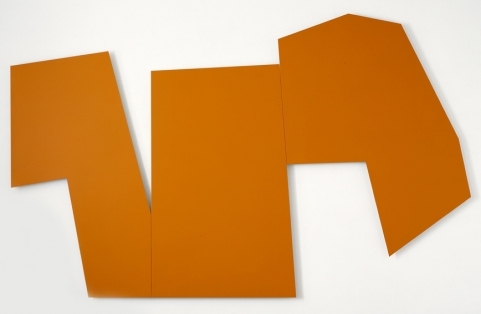 White Cube’s 9 x 9 x 9 Bermondsey location is currently showing the first ever Imi Knoebel exhibition in London. Real name Klaus Wolf Knoebel, the German minimalist artist is part of the Dusseldorf generation along with Joseph Beuys – his former teacher at the Staatliche Kunstakademie of Dusseldorf – and Jörg Immendorf with whom he manifested for Solidarnosc, revealing his political and social commitment. His exhibition at the White Cube gallery presents more than fifty years of drawings, paintings, sculptures, photographs, projections and installations, signifying the diversity of his work and career. In the line of Mondrian structural arrangements or Malevitch geometrical forms, Knoebel creates abstraction pieces leaving aside the spiritual aspect of the above-cited modernist masters. The works that constitute the exhibition of the White Cube collide in order to create a single work joining in an endless discussion on form, color and space. Mostly made out of aluminium panels – material that he first used in 1991- this series reinterprets New York constructions and skyline. 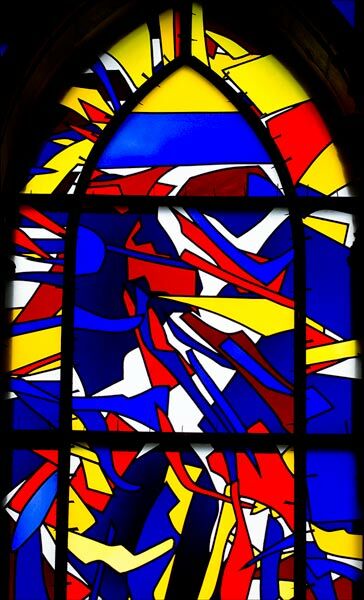 With MOLANI (2001) Knoebel rehashes the window form, a structure that he comprehends thanks to the stained glass he realized for the Reims Cathedral in 2011, on the occasion of the monument 800 years anniversary. Concerns of geometrical, color and material matter are therefore leading this quadratic show.